← The End of a Great Carnival!! May 17th, 2011. 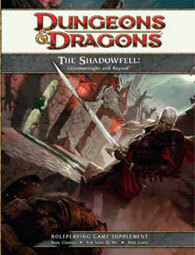 The release of the Shadowfell: Gloomwrought and Beyond boxed set. I’ve had this on pre-order from pretty much the same day Amazon (at least in the UK) had it on their site! Lots of pre-release reviews are starting to come out (e.g. Here, and here , and here and here… ) and from what I’ve read so far it doesn’t look like I’ll be disappointed! Ever since the 4E cosmology came out I’ve been fascinated by the Feywild and Shadowfell concepts, and its good to see WOTC are supporting these well. I can understand the thinking that there are more ‘players’ out there than ‘DM’s’, given the normal 5:1 ratio of the standard adventuring party. However, I’m sure in most groups there is more than one at least part-time DM, and in any case in my experience it’s the DM types that spend the most on D&D products anyway. So it seems to me that the D&D Insider model is actually a better delivery mechanism for player material, whilst traditional printed material is better for DM aligned products? What do you think? This entry was posted in 4E D&D. Bookmark the permalink.